Last week I taught my most favorite cooking class thus far: pizza-making. Most people dial for pizza delivery (take-away). But it’s so incredibly simple to make and what you get is sooooo much better and healthier than what’s available at most pizza joints, that you’ll be your own favorite pizzeria before too long. Dough is the most crucial part of the process. Before teaching this class I made my dough in the bread maker (yes, I still have that relic from the 90s). However as most people don’t have a bread maker I needed to find a new recipe. Kneading dough, knocking it back, etc. was way too involved so I was thrilled when I discovered Jim Lahey’s “no-knead pizza dough”. It’s brilliantly simple: just stir flour, yeast, salt and water until combined, cover with plastic wrap and let sit for about 18 hours. Then shape it with your fingers and bake. The only problem is that dinner is typically at 6-8pm, and to have that dough ready at that time you need to mix it together some time between midnight and 2am. Not exactly ideal, no matter how much you love your pizza. So the brilliant Deb Perelman over at Smitten Kitchen played around with the recipe and came up with three more human-friendly options, all of which assume dinner is between 6 and 8pm: overnight dough (sits about 22 hrs – mix dough between 8 and 9pm the evening before), all-day dough (sits about 12 hrs – mix between 6 and 8am that day) and part-day dough (sits about 6 hrs – mix around noon that day). Once you have made your lovely dough, you must treat it gently. On a well-floured counter, massage it into shape using the lightest touch possible so as to retain the air pockets that formed while the dough was sitting. 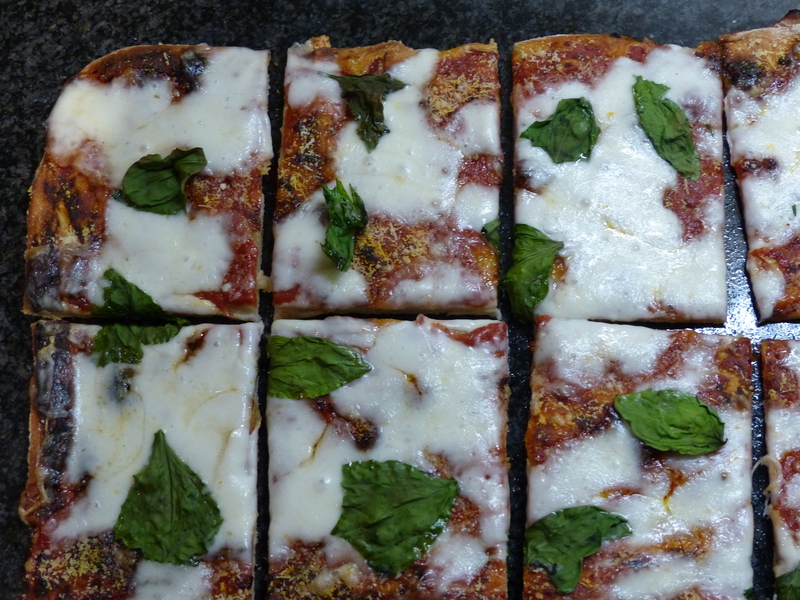 Getting the dough from the counter onto the pizza stone or baking sheet (I use a 9″x13″ rimmed metal sheet and it works great) can be a bit tricky. Easiest way is to maneuver one side of the pizza over one arm then come from under the opposite side with your other arm, palms faced down. This video from a pizza class at Pizzarium in Rome demonstrates it very well; much better than I can describe in words. Keep the toppings simple. 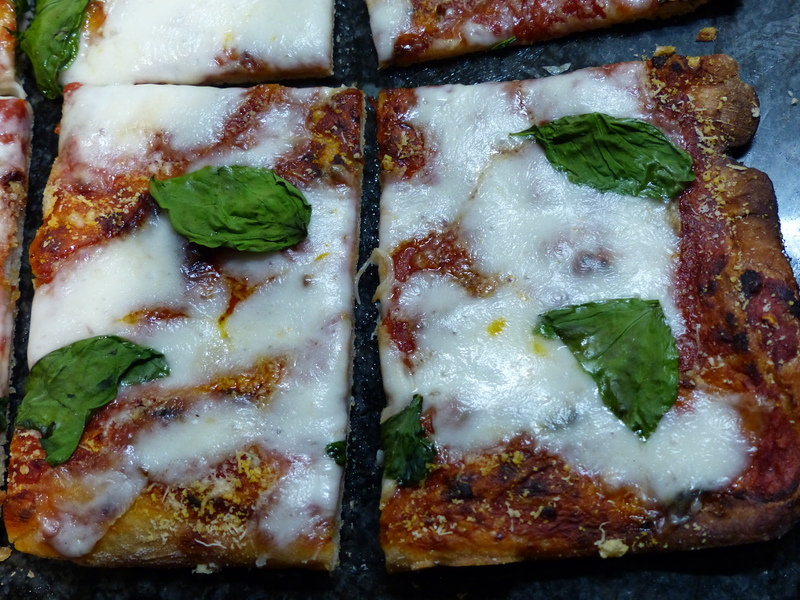 I like tomato sauce, mozzarella, parmesan and basil – your classic Margherita pizza. Feel free to toss a few mushrooms, onions, spinach or your veg (or meat) of choice. Just use some restraint and limit it to no more than three toppings or the pizza gets soggy. Also I find it best to saute the veggies for a minute or two before placing them on the pizza – they adhere better and won’t dry out when baked. To keep a crispy crust bake the pizza with just the tomato sauce (or if you’re doing pesto pizza or a white pizza just with the pesto or olive oil) and only bake the toppings for the last 3 minutes of cooking. Go ahead and give it a try. With a little bit of practice, you’ll soon be giving Domino’s a run for its money. 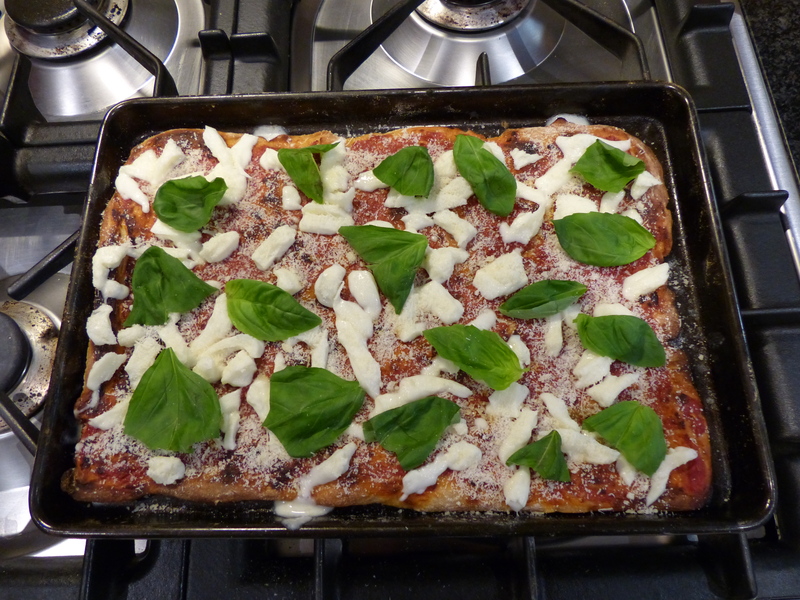 Note: This makes a basic tomato sauce, mozzarella and basil (“margherita”) pizza. Use a firmer mozzarella rather than the type packed in water which will make the pizza soggy unless you cut them and let them sit on some paper towels to absorb moisture). Feel free to top with some additional toppings as well, though no more than three are recommended or pizza may get soggy. Lightly brush a baking sheet (rimmed or un-rimmed) with olive oil (I use a 9”x13” – 23cm x 33cm – metal rimmed sheet). Heat oven to it’s highest temperature, typically 500º F (250º C). Flour your counter well. Flour the top of the dough, and divide dough in half. Set one half aside. Using well-floured hands gently massage/press the edges out, then gently massage/press down in the center leaving any air bubbles. Be gentle – do not press down firmly. Flip dough over, sprinkle top with more flour, if necessary, and gently press edges and middle. Flip and repeat again. During this whole process there should be enough flour both on the counter and sprinkled atop the dough so that you can flip the dough in half over itself and it won’t stick. 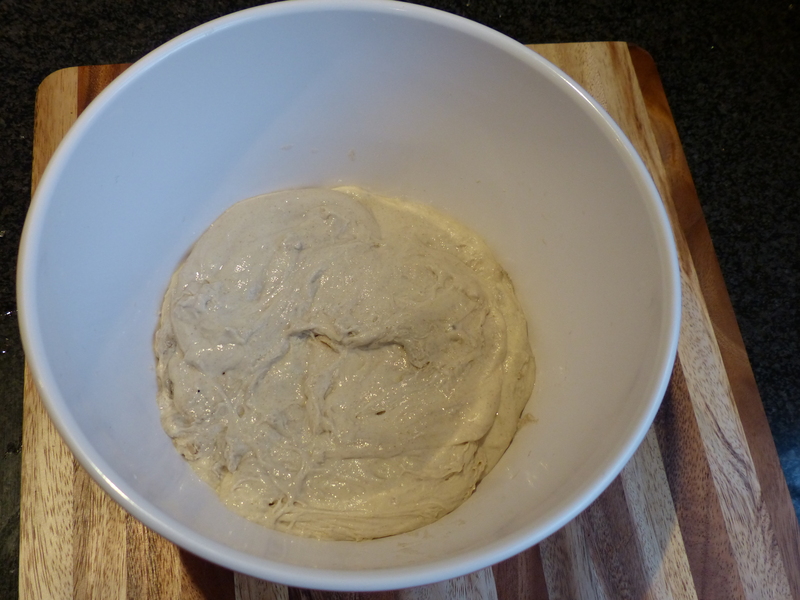 Once the dough is roughly the size of the pan, though slightly smaller, put dough over one arm, lift off counter and gently slide other hand below the dough, fingers facing downwards. 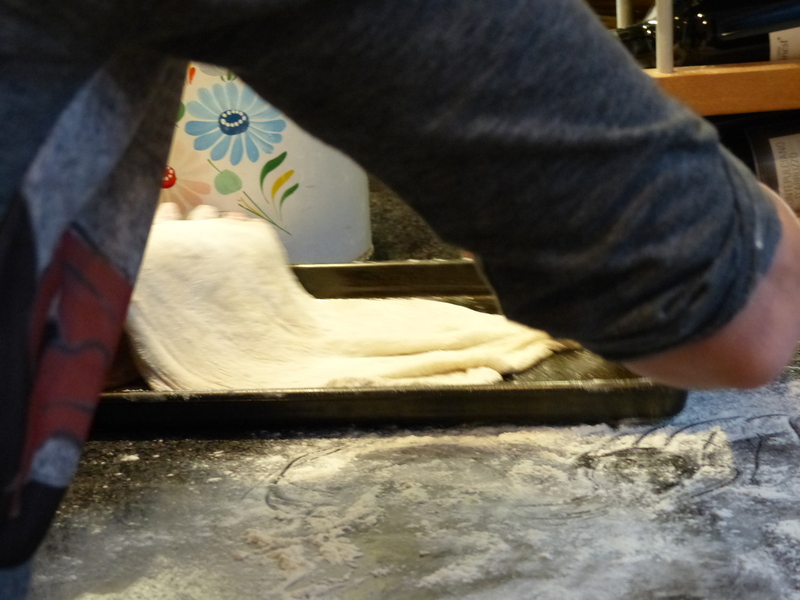 Place dough on prepared baking sheet and gently press to fit the sheet, pressing the edges down. 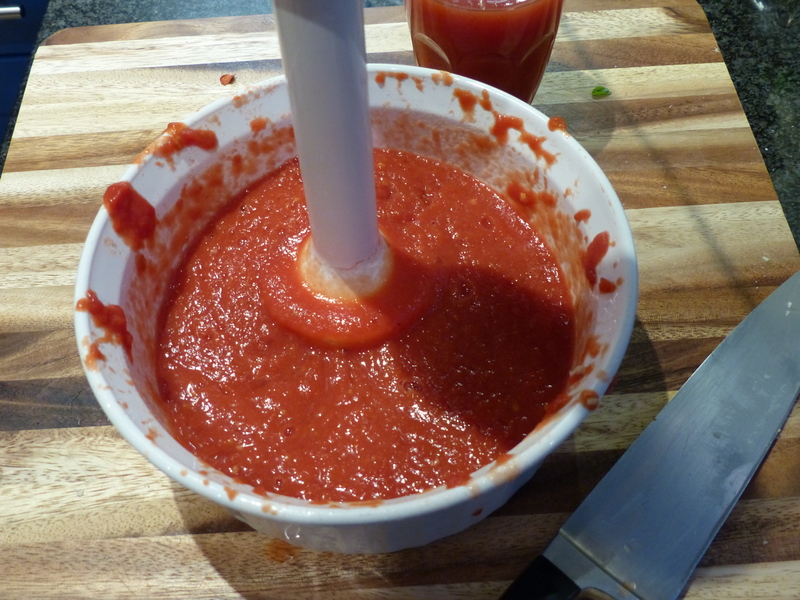 Gently spread 120 ml (1/2 cup) Tomato Sauce on the dough using your fingers or the back of a spoon, being careful not to press the dough too hard. Drizzle with some olive oil. Bake on the bottom oven rack for about 15 minutes. 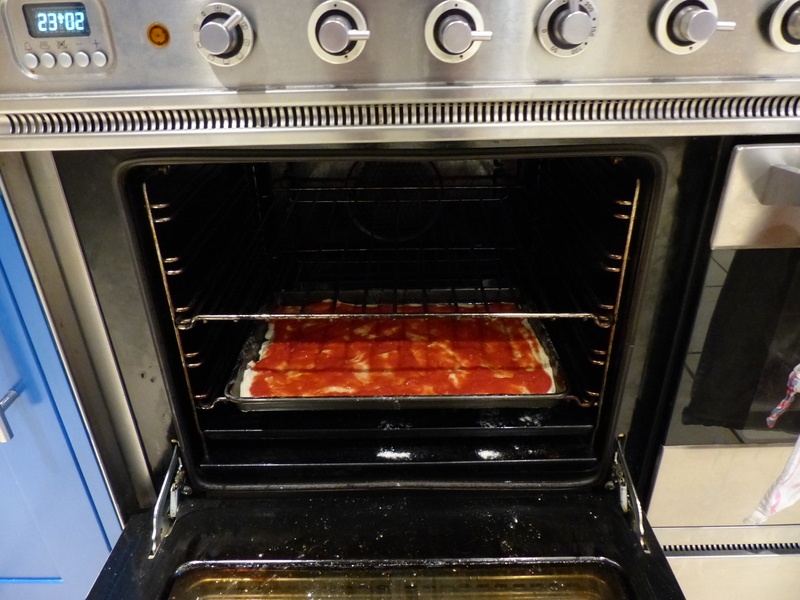 Remove from oven and using a spatula lift pizza up and check if crust is almost done. If so, move to the center of the oven and bake another 5-10 minutes until pizza is lightly browned and crisp (pizza will cook faster now that it’s in the center, so be careful that it doesn’t burn). Remove pizza from oven and top with 110 grams mozzarella, 2 tablespoons parmesan and the basil and bake an additional 3 minutes or so until cheese has melted. Remove pizza from tray, place on cutting board, slice using a pizza cutter or large knife and serve. Repeat with the remaining half of dough. 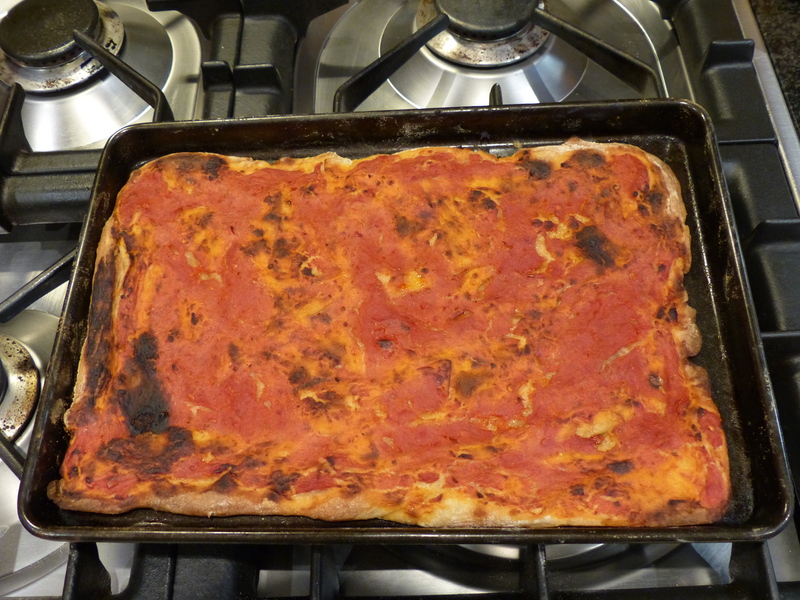 Note: This recipe makes two 9”x13” (23cm x 33cm) rectangular pizzas (or you can make round pizzas of a similar size) and serves 4-6 people. 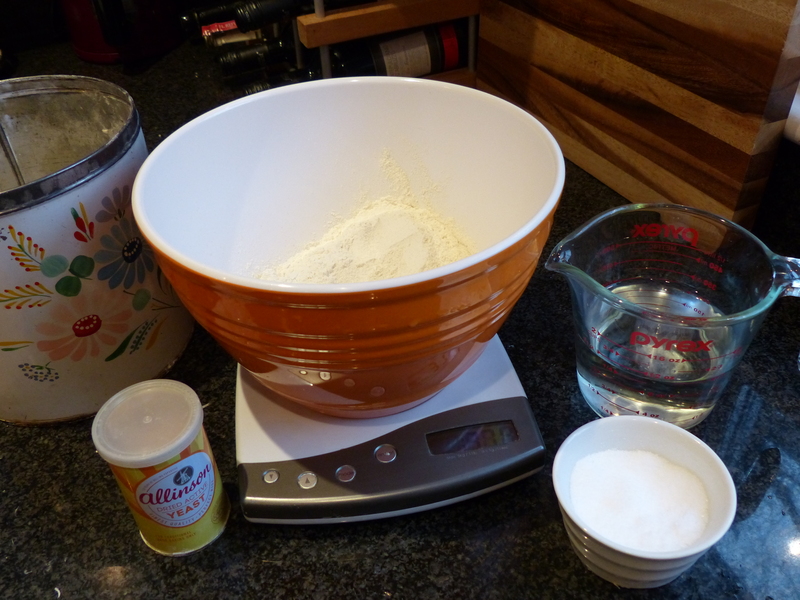 If you have a scale, I highly recommend weighing the flour for a more accurate measurement. If you don’t have a scale, be sure to use the “fluff and scoop” method with a dry 1 cup measuring cup: fluff up the flour with a spoon, scoop up flour with the measuring cup and swipe away excess with a butter knife. Do not pack the flour. 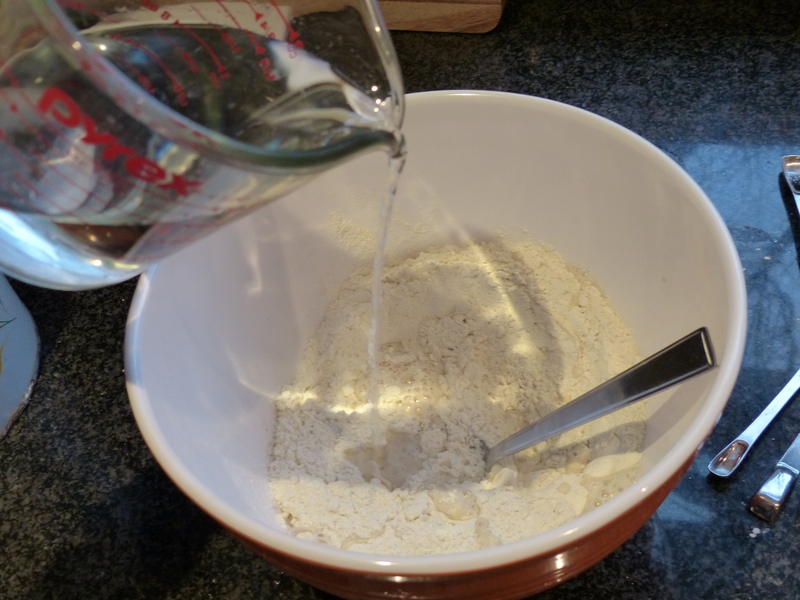 In a large bowl, whisk the dry ingredients. Add water and stir together with a spoon. The dough will be a bit thick and rough; this is fine, but if it feels excessively so, add another teaspoon or two of water. Cover bowl with plastic wrap and keep at room temperature for approximately 22 hours (for Overnight Schedule), 12 hours (for All-Day Schedule) or 6 hours (for Part-Day Schedule), or until the dough has more than doubled. This takes longer in a chilly room and less in a very warm one. Just don’t place in a boiler room or exceedingly warm space (like you use for proofing bread dough). Keep it at room temperature. * The dough requires sitting for anywhere from 6-22 hours, depending what suits your schedule best. Note: Canned (tinned) tomatoes are superior to store-bought tomatoes for most of the year, so use canned tomatoes unless you have a bumper crop of excellent fresh tomatoes to use up. San Marzano are some of the best, so get those if you can. This sauce is also nice tossed with pasta. 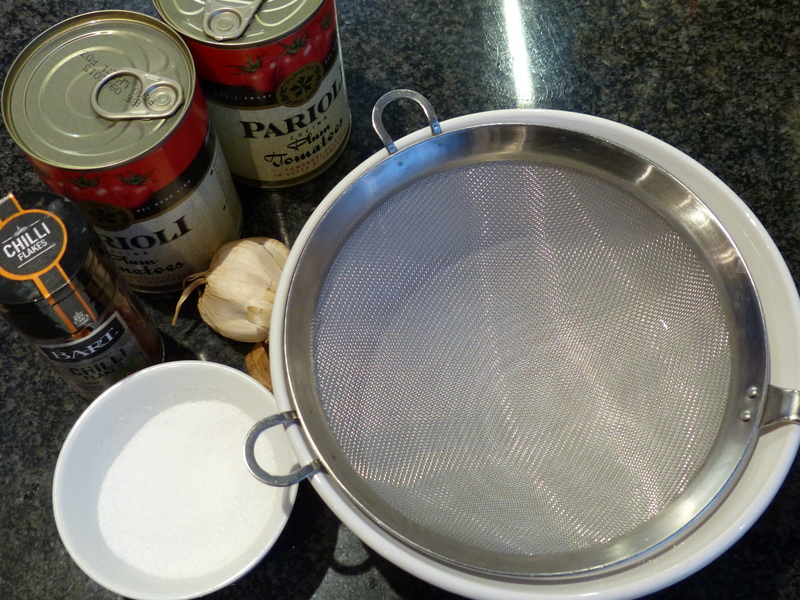 Add garlic, salt and red pepper flakes to the tomatoes and blend in a blender or with an immersion blender until smooth, or if you prefer chunkier, mash with a potato masher. 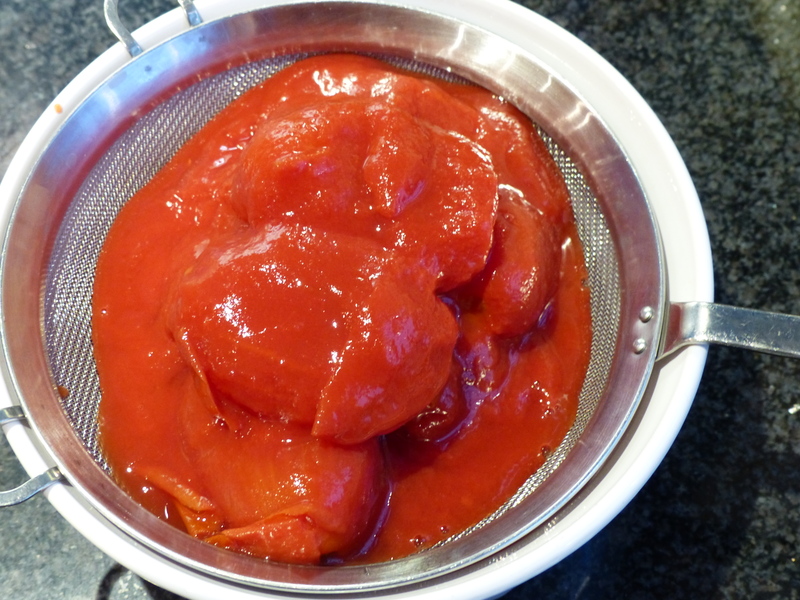 Sauce can be stored in the refrigerator for up to a week or in the freezer for about 3 months longer. Thank you for doing the research, definitely will try as my pizza crust does not turn out the way I like it. Hi Maria, researching pizza isn’t too bad:) I made it last night and just let the dough sit for 4 hours and it was still really good. Let me know how it goes.